Portable, lightweight and dependable… Krown’s PortaView PV20 JR TTYdelivers superior communications for all your telephone calls! 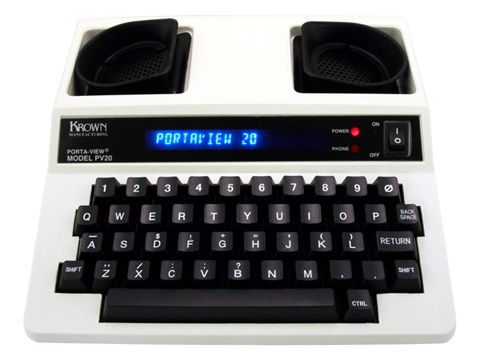 Krown’s reputation of providing the most technologically advanced and highest quality TDDs at affordable prices is reflected in the PortaView 20 JR. Feature for feature, the PV20 JR is an excellent value when compared with other TTYs available today. It utilizes the same degree of quality engineering to provide years of the highest reliability and outstanding performance. NOTE: All batteries can run 3-7 hours when fully charged.